Success! Bright from Uganda raised $249 for hernia repair surgery. Bright's treatment was fully funded on November 1, 2016. Bright successfully received hernia repair surgery. Bright is doing great and his surgery was a success. He is currently at home resting with his family, and already feeling so much better. He has shared that he feels much less pain now and is more calm and peaceful. Now that his hernia has been repaired, he is no longer at risk of intestinal incarceration, obstruction, or strangulation. Bright is a 32-year-old, single father of three from Uganda. He works as a laborer, making bricks and working in fields. Bright is most happy when he is with his kids, and when he is at peace with his neighbors. Two years ago, Bright started feeling pain in the upper abdomen after meals, and later developed swelling in the same area. Due to the pain, he is unable to lift heavy items, walk long distances, or eat enough food. He visited a hospital where he was diagnosed with a hernia. He was advised to have surgery, but he could not afford to pay for it. If left untreated, Bright will continue to experience pain and other potential complications. For $249, Bright is able to undergo hernia repair surgery. After surgery, he hopes to continue digging and making bricks to sell in order to take care of his children. “My children are my priority. How I wish I could take good care of them,” Bright shares. Bright's case was submitted by Joan Kadagaya at African Mission Healthcare Foundation in Uganda. Bright was submitted by Joan Kadagaya, Curative Medical Support Program-Partner Representative at African Mission Healthcare Foundation, our medical partner in Uganda. Bright received treatment at Holy Family Virika Hospital. Medical partners often provide care to patients accepted by Watsi before those patients are fully funded, operating under the guarantee that the cost of care will be paid for by donors. Bright's profile was published to start raising funds. Bright's treatment was fully funded. Bright's treatment was successful. Read the update. 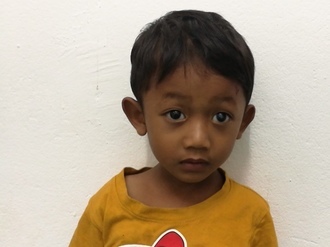 Cheang is a four-year-old boy from Cambodia. He has one brother, and enjoys playing with toy cars and eating fried pork. Two months ago, Cheang developed a cataract in his left eye, causing him vision loss. He has difficulty seeing things clearly, recognizing faces, and going anywhere outside. When Cheang learned about our medical partner, Children's Surgical Centre, he traveled for one and a half hours seeking treatment. On April 23, doctors will perform a lensectomy and an intraocular lens implant in his left eye. After recovery, he will be able to see clearly. Now, he needs help to fund this $211 procedure. His mother says, "I hope that after my son's surgery, I will no longer worry about him because he will be able to see clearly." Kenema is a farmer from Uganda. She is married and a mother of six children. For ten years, Kenema has had an epigastric hernia. This hernia causes her pain and discomfort and it is affecting her work on her farm. Fortunately, on April 10, she will undergo hernia repair surgery at our medical partner's care center. Our medical partner, African Mission Healthcare Foundation, is requesting $249 to fund Kenema's surgery. Once completed, this procedure will hopefully allow her to live more comfortably and confidently. She says, "I like singing in church choir."